Welcome back to Concerning News Network with your host, MJ Khan. As we reflect on the bloodshed and destruction that has engulfed the world in the past two weeks, tonight we uncover the events leading up to what has tragically been referred to as the 'Coke Jihad'. We now cross over live to our field reporter, 'has-been' Bollywood star Kareena Kapoor who is one of the few survivors of the land which used to be known as India until last Wednesday. MJ: Kareena, a population of over a billion people have been wiped out by the nuclear blast over Delhi last week, how many survivors are there? Kareena: MJ, the scenes here are harrowing, I am currently standing next to the Ganges river in a land which was called Varanasi, and while the river is still as polluted as it was last month, there are now high levels of radioactive waste mixing with the ashes and raw sewage. This scene reminds me of my poor Shaheer. India will never bear another son like him. MJ: Kareena, How did this war start? Kareena: The war started a month ago when some individuals from a Danish terrorist group called Citizens opposed Killing Economies sent a hoax e-mail out in protest of the economic boycotts that some Muslim countries have placed on Danish products following the 'prophet Muhammed cartoon saga' in September 2005. 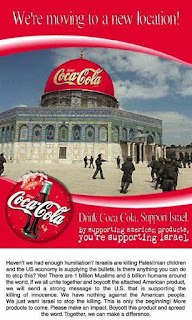 The e-mail included a fake Coca Cola print advertisement which incensed the 1.6 billion Muslim population. This led to the burning of embassies, as well as wide scale riots in Mombasa, London, Chechnya and Houston Texas. A critical point in the saga was Monday when well known actress and humanitarian Angelina Jolie was assassinated during an AIDS awareness concert in India. This led to nuclear retaliation by America. MJ: Can you describe the hoax advert to the viewers. Is this the first time that Coke was used to incite a particular religious or ethnic group?